A ground-breaking diet plan that helps eliminate the surprising 'healthy' foods that are making you fat - and lose weight fast. In this revolutionary, NEW YORK TIMES bestselling book, cutting-edge nutrition expert Lyn-Genet Recitas reveals the surprising truth behind what actually makes people pack on the pounds - and it isn't carbs or portion sizes. Foods that are revered by traditional weight loss programmes may seem healthy, but when combined with each person's unique chemistry, they can cause a toxic reaction that triggers weight gain, premature ageing, inflammation and a host of health problems. Avoid feeling bloated, tired or unhealthy again! Feel better, look better and be empowered by the knowledge of what truly works best for your body! The groundbreaking diet plan that helps you eliminate the suprising "healthy" foods that are actually making you fat. 4.0 out of 5 starsThis will get rid of your sugar cravings if you have them! I almost feel like my review is not necessary because there are so many but thought I’d write one anyway in case it helps someone. I didn’t have a lot of weight to loose. I’m a 45 year old mom of 16 year old twins and I weighted 129 pounds and I am 5’4”. I realize this is within normal range but I feel best when I weight under 125. When you are at this range 5 pounds feels like a lot. My clothes were always tight and I generally just felt bloated sluggish and not at my optimum weight. I can feel the collective eye roll from some of you but this review is for people like me. I had been counting calories and ordering salmon at restaurants for almost a decade trying to lose 5 pounds and I would after a few months only to have it come back the second I ate even the least bit “bad”. Worst of all I had UNCONTROLLABLE sugar cravings. The cravings were uncontrollable and they controlled me. I heard about this book from a coworker and got it and read it. I have some words of advice on the read - I read it all the way through and mostly skipped all of the testimonials. They get to be a little much. I get there are a lot of success stories but there are way too many in the book. So I read it through and skipped those but pay attention because some of the inset boxes are not testimonials and have information that you need. So after the first read I read it again with a highlighter and highlighted information I wanted to remember. Then over the course of the next few weeks I’d review my highlights. Before I started I formulated a plan and gathered supplies but I also started with the water consumption to train myself to drink the water in the quantity and timing she recommends (half your body weight in ounces per day and with 45 minutes before and after meals and to have it all drank before dinner and to not drink any after dinner). I also modified the plan some. The book cautions against this but I still had success. But everyone is different. For me the modifications still worked. For others maybe not. For example I’m never going to eat sautéed kale and during the cleanse I still had my one cup of coffee each morning. And for me turns out I am not reactive to many things so the plan was easy. But I can see if you are reactive to a lot it might be hard. But regardless better to know than not. So I lost 8.5 pounds in about 2 weeks and have stayed there. I’m on day 52 now. I had an out of town trip and ate out a lot including in and out burger (which I later regretted because it really wasn’t that tasty). When I came home I had gained 2 pounds but jumped right back into the plan and by the end of that week was back at my weight. All of this is great but here’s the most important thing for me - this plan crushed my constant sugar cravings. They are gone and it’s changed my life and I’m so thankful. My husband buys girl scout cookies by the dozens from any Girl Scout that asks him. Which is sweet but we have literally dozen of boxes of delicious thin mints in our pantry and freezer. Before the plan I could easily eat an entire sleeve of them per sitting. They would beckon me and I couldn’t resist their call. But I have been able to not eat a single one and more importantly not even think about them. This may sound dramatic but I feel like it’s a miracle. I feel better and my attitude towards food has completely changed. I feel empowered with food knowledge. A lot of reviews note the editing and the recipes being incomplete which is true but just use your common cooking sense and read the recipe completely through before starting. For example there are a couple that list ingredients but then in the instructions never have you add them. I just add them where they make sense or omit them if I think they are not necessary. There are also some reviews that say it’s expensive. This is relative. If you have no spices and have to buy them all maybe. I already had most of them. It’s pretty much all fresh food so you’ll have to shop more often. I’d say it’s added maybe $100-150 a month to my grocery bill. For me that’s not a bad trade off for the result but some might think it’s too much. 85 people found this helpful. This review is written for all the 40+ women out there who have struggled and struggled to lose weight on any diet. I am one of those women. I am 48, work out 10 hours a week, eat 1200 calories a day, and am 20-30 pounds overweight and no matter what I did, could not budge the scale. I used to work out 5 hours a week and decided to double it thinking that the extra workouts would "beat" the weight off of me. So, I upped my workouts and......NOTHING! I had three kids in 5 years - the last when I was 42. I was able to get the weight off with the first two, but what worked with the first didn't work with the second and nothing worked with the third. I had had previous success on weightwatchers, so I tried that again, but given that I'm a vegan and the points system now doesn't count any of the fruits and vegetables you eat, well, that's a problem since that's where all my calories are coming from. I tried a high protein/low carb diet, which had limited success, but vegan sources of protein tend to be carby and although I'd only be eating about 1,200 calories a day, I'd struggle to even take off 1/4 of a pound a week! My 6'6", 185-pound husband, who eats whatever he wants, whenever he wants says, "it's calories in/calories out". Clearly, if that's the case, then this is new math that I don't understand. I would get down in the dumps because I felt like I'd never get rid of the extra weight, but was at a complete loss for knowing what to do to get it off. I was ready to give up, but I couldn't give up. Carrying extra weight around for many years is unhealthy. A friend of mine, who is also in my age group, recommended this book. I'd never heard of it before, but went out to Amazon to read the premise and the reviews. The reviews seemed like they were all written by people like me. I read on and saw that she provided options for tailoring The Plan to vegans and vegetarians, so I decided "what the hell" and bought the book. I spent the first week reading the book and looking through the recipes. There's a fair amount of prep work that needs to be done to get your food ready for the first week. That said, the recipes are all super simple to make. They're not gourmet, but they're palatable. I read the book's Plan for the first week and then pulled down the vegetarian and vegan menus off her website and kind of put together a hybrid plan for the week. I've been on The Plan for a week now and have lost.........wait for it..........9 pounds!!! How is that even possible? I don't know and I'm not asking - who cares? And even though I'm only one week into this and still have a fair number of days left to go, I don't even really care what happens from here on out because I'm down 9 pounds! 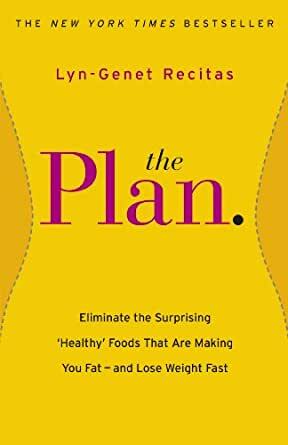 The Plan makes perfect sense to me and is the first time I've ever come across a diet plan that is tailored to your body. I did another "medically supervised" diet plan where you were eating 1,200 calories a day and were supposed to take off 2-3 pounds a week. When I struggled to take off 1/2 a pound a week, I asked them why and they couldn't answer me. If it's a simple calories in/calories out equation, then anyone who was dedicated could lose weight. For some of us, our bodies attack the food we put in it and that has to be remedied. Her premise is such an interesting concept and explains so much about those folks who we all know who seem to eat whatever they want and stay as skinny as a rail. Most of us chalk it up to a faster metabolism, but how could someone's metabolism be really that much faster than another person's? The way I interpret The Plan is that it's a personalized eating plan that tailors foods to your body chemistry so that we all can eat "whatever we want" and stay slim and fit. We all have the same metabolism, but those people who stay slim eating everything have a much more efficient metabolism because there aren't any foods that hang up in their system. For the rest of us, it's a scientific puzzle to figure out what works for us and what doesn't. I also think she's really on to something with the whole aging process and our systems becoming sensitized to certain foods that once gave us no trouble when we were younger. I am a huge believer in this book and plan. I have turned three other people on to it and they're now doing it as well. Given that it's the only thing that has worked for me, if you're in the same boat and find you can't budge the scale no matter what you do, it's at least worth a try. I feel great, my arthritis has lessened, and I'm eating avocados for the first time in a couple of decades! Give it a try. 257 people found this helpful.